The arrival of a new Ólafur Arnalds release is always a special occasion. The gifted, young Icelandic composer has been continuously making ground-breaking music, constantly pushing the sonic envelop, ever since his 2007 debut ‘Eulogy For Evolution’. The new record is entitled ‘For Now I Am Winter’ and represents a new and glorious chapter in the Arnalds songbook. As ever, intricate arrangements of strings, piano, and electronics are gorgeously fused together, creating divine modern classical music and beguiling ambient soundscapes. Arnalds is akin to an artist of the floating world – forever soaking up life’s inspiration that surrounds him, and exploring new territory with each turn. This exploration in sound is truly in fruition on ‘For Now I Am Winter’, where new sonic terrain is covered. The graceful minimal melodies and intricate arrangements remains at the core of Arnalds’s shape shifting works. The Icelandic composer is experimenting further with faster tempos, more use of electronics, and addition of vocals. 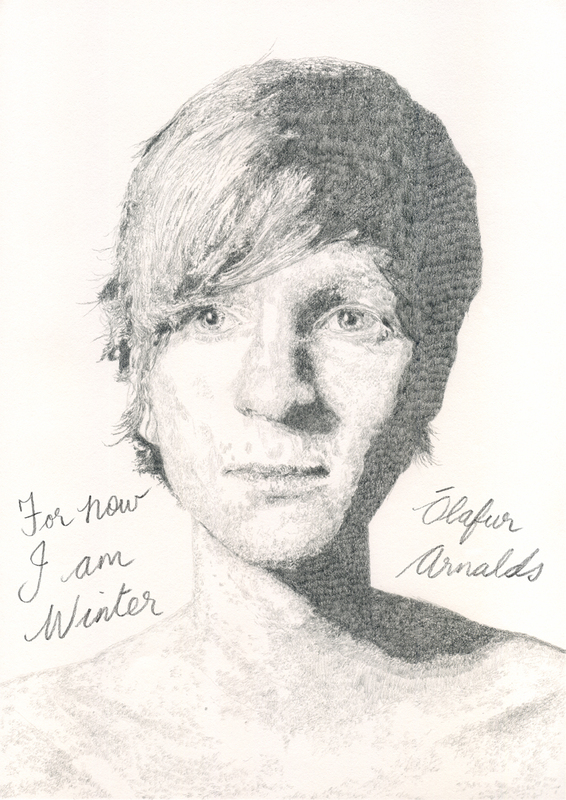 ‘For Now I Am Winter’ is a work of beauty and showcases Ólafur Arnalds’s undeniable genius. Born in the suburban Icelandic town of Mosfellsbær, a few kilometers outside of Reykjavík, Arnalds has been responsible for a wide array of compelling and innovative releases; from scores for film (‘Another Happy Day’), groundbreaking studio albums (‘…and they have escaped the weight of darkness’ (2010), ‘Living Room Songs'(2011)) and collaborations (‘Stare’ EP with close friend, Nils Frahm). ‘For Now I Am Winter’ is a lyric to the title-track of the album, sung by Arnór Dan. The title resonates powerfully for the heavenly music composed, arranged, and produced by Arnalds. The gorgeous tones of piano, soaring strings, and compelling electronica possesses an otherworldly realm to truly transcend space and time. As ever, the music of Arnalds casts light on the darkness. Album opener ‘Sudden Throw’ begins with delicate notes of piano and hushed ambient textures. The piece builds on a repeated piano note that is soon accompanied by a breathtaking orchestral arrangement. The dynamic and feel to this piece of music serves as the perfect prologue to the magical journey of ‘For Now I Am Winter’. The orchestration on ‘For Now I Am Winter’ is arranged by Nico Muhly, who is similarly responsible for some of the most innovative modern classical compositions of the 21st century. The orchestral arrangements were performed by members of the Icelandic Symphony Orchestra and conducted by Atli Örvarrson. All tracks were composed, arranged and produced by Ólafur Arnalds. Four compositions were co-written by Arnór Dan, who adds vocals to the divine stratosphere of sound. The title-track breathes heart-wrenching soul. ‘For Now I Am Winter’ is laden with digital warmth of electronic beats, piano and strings. I feel the song shares the spirit of James Blake’s ‘Limit To Your Love’, where the searching vocal line is awash in an ocean of ambient bliss. ‘A Stutter’ is built upon a returning piano triad. The three piano notes meander delicately around the cosmic space of ambient soundscapes, and emotive strings. I love just how Arnór Dan’s voice effortlessly melts into the music, and as the strings build to a swirling crescendo, the voice and music become one. ‘A Stutter’ is one of the album’s centerpieces. The strings gradually fade into the foreground,as a stream of harmonies wonderfully filter into the headspace. Magic is created. A record that comes to mind is ‘L’Absente’ by Yann Tiersen, where many guest vocalists are interwoven amongst Tiersen’s divine compositions of piano, violin, and accordion. The endearing voice of Arnór Dan is reminiscent of Lisa Germano’s breathtaking voice. The result is nothing short of life-affirming. ‘Words Of Amber’ is a mesmerizing solo piano piece. I am immediately transported to the Erased Tapes back-catalogue of work; from Arnalds own previous work, Peter Broderick and Nils Frahm. The piano is played in the quiet still of night, as the soft dampen tones rise and fall with each deft touch of Arnalds’s hand. ‘Reclaim’ begins with brooding film-score strings, that could be ‘Camille’ by Georges Delerue. This song for me, epitomizes the adventurous spirit of Arnalds, and the innovative nature of the sublime work of art that is ‘For Now I Am Winter’. Worlds of sound are infused here, from pop structures, ambient touchstones to ground-breaking chamber music. Think Talk Talk’s Mark Hollis in collaboration with Canada’s Owen Pallett, and you are somewhere close. The dynamic changes on the slow ambient work of ‘Hands Be Still’. I hear the distant echoes of Arnalds’s collaborative work with Nils Frahm here. The minimal melody serves the central motif to this cinematic piece of music, that returns throughout. Delicate strings bring this piece to a gentle close. ‘Old Skin’ is the return of Arnór Dan on vocals. The parts form one cohesive whole, as a myriad of sounds are joyously fused together, and the sound is distilled in Dan’s lyric of “this world collides”. ‘Only The Winds’ is based on a beautiful piano melody. A gorgeous kaleidoscope of sound unravels before your very eyes. I hear the influence of Arnalds’s film score work during this magnificent piece. Three minutes in, emotive strings ascend into your consciousness that is reminiscent of Icelandic composer Jóhann Jóhannsson’s work. A sacred dimension is tapped into here, where soft pulses of ambient touches evolve into meandering piano melodies and soaring strings, performed by members of the Icelandic Symphony Orchestra. ‘Only The Winds’ is my current favourite. The strings gently rise to an achingly beautiful crescendo alongside guiding electronic beats. The strings exude a world of emotion, where I am left dumbfounded by its sheer beauty and supreme spell. An extraordinary piece of music. ‘We (Too) Shall Rest’ is the shortest cut on the album, at two minutes in length. A gorgeous ebb and flow of solo violin comprises this reflective piece, which exudes a feeling of solitude – the quiet moment where you’re alone with your thoughts. ‘This Place Was A Shelter’ is stunningly beautiful. Nico Muhly’s orchestral arrangement dances around with the layers of piano and electronic beats, forming an otherworldly, expansive sound. ‘Carry Me Anew’ contains divine ambient soundscapes that breathes solace and hope. A new horizon is forged, as a sunrise slowly forms on the early morning sky, with the break of a new day. ‘For Now I Am Winter’ by Ólafur Arnalds is out now on Mercury Classics. Please tell me about your new album ‘For Now I Am Winter’. What were your objectives from the outset when working on this new record? I actually set out to try and do something different than what i had previously done. I felt that I was getting to the point where I would start repeating myself or being predictable so I wanted to explore new areas and see if I could learn something from it. I love the album title, ‘For Now I Am Winter’ and cover artwork. What was the inspiration behind this title and artwork? The title originally comes from Arnór Dan’s lyric to the title track. It was just something he started singing out loud when we were in the studio. Later, I felt like it perfectly described my whole view of this whole album. It says that even though now is winter, it is not endless. There is always spring after the winter. Light after the darkness. The cover artwork was designed by Jónas Valtýsson, as most of my other records. I can see how this record ‘For Now That I Am Winter’ is a big step for you, where you are trying something different. I can make a parallel with your friend and colleague Peter Broderick who similarly changes direction on his artistic path, especially his recent (and wonderful) album ‘These Walls Of Mine’. Discuss please your feelings of wanting to try something different and what differences you see between ‘For Now That I Am Winter’ and previous works? It is a very experimental process. I never decided what i wanted the album to sound like but rather experimented until I found things that I was into and wanted to explore further. Those included vocals, more electronics and faster tempos. I think the songwriting itself stayed pretty similar, but the production changed a lot. So the melodies are still very minimal but the arrangements is large and busy. The piece ‘This Place Was A Shelter’ from the new album is stunningly beautiful. The intricate layers of strings, electronics and piano form this otherworldly expansive sound. It reminds me of Jóhann Jóhannsson. Can you shed some light please on the composition and arrangement of this piece of music? I think it comes from the oldest idea of the record actually. I made that drum beat a long time ago as I was experimenting with electronics, but it never became a real song until very late in the process. It was probably one of the last songs I finished writing for the album. The piano chord progression is very simple and the same throughout the whole song as it was created with the beat and actually forms an uncompromisable part of the drum beat. So the whole movement in the song comes from the string quartet and orchestra. The orchestral arrangement was made by Nico Muhly and kind of dances around the melodies that I had already in the string quartet and piano. You are an incredibly gifted multi-instrumentalist and composer with so many awe-inspiring and compelling releases already under your belt. What were your first musical memories and can you remember what stage in your life that you began your fascination with sound? I can still remember the first song I ever wrote. My fingers were so small I could only do one chord on the guitar and i had to lay it on the floor to be able to play it because i couldn’t reach around it. I made a song out of that one chord and played it for hours on end, driving my whole family crazy. I guess from that point on I just kept exploring. I love the amazing ‘Living Room Songs’ album. What struck me is how the songs were recorded live in the living room of your Reykjavík apartment, creating a new song-one per day, for a week. Can you discuss please this particular project and how the recording process developed over the course of seven days? The idea behind this (and the similar Found Songs) was to take all the ideas i had in the back of my head and throw them all out at once so I could start with a clean slate with the new album. I was very into the idea of inviting people into my living room and making the experience interactive and personal. At the end of the week though I was getting rather tired and struggling more and more to find good ideas. In 2012 you played 43 concerts in 13 countries. What concert(s) for you do you remember as being the most special for you, personally? Discuss please the live performance dynamic and how you feel your music evolves as it is transported from the studio setting to a live setting? I don’t think I can mention any specific show as the most special one, everyone is different and good in it’s own right. Even bad days have good shows. When playing Live i don’t necessarily try to recreate the moods of the albums but rather try to create something new and special. Something that can only be experience in that place at that moment. I absolutely love your collaboration with your close friend and colleague, Nils Frahm on the Erased Tapes E.P ‘Stare’. It is simply astonishing ambient music that I have revisited many times. You spent time in Nils’ Durton Studios in Berlin and later, the same was done in Reykjavik. Can you discuss how these musical ideas you both had and shared, developed into this final ‘Stare’ E.P and what it was like collaborating with Nils? Well actually we are just friends and don’t look at this project like we do our own solo projects. So basically we just meet up and order some pizza, have some beer and chocolate and talk about everything and nothing. Sometimes musical ideas come out of that and then we might create something. We never really met up for the sole purpose of making music, but as it is both of our main interests, that’s usually what we end up doing. You have scored many films. How does this side of making music change from making music for your own albums? For example, when composing music for ‘Another Happy Day’, did you have a framework in mind regarding themes, director’s notes? I’m still learning my way around film composing. I recently finished an 8 part miniseries for ITV called Broadchurch and I feel that I learned a lot from that and can finally actually call myself a film composer! Now I try to spend a couple of weeks just writing themes on their own before I even start writing to the images. It’s hugely important to have a good ‘database’ of themes and ideas before you start. But when writing for Another Happy Day I was very inexperienced and probably jumped into the deep end of the pool too soon and just wrote it like i was writing an album, one song/scene by one. I still love that sound track though! Lots of good stuff came out of that. It’s interesting because with films you already have a framework set out for you, and often some notes from the director. Everything needs to fit into this world that the film has already become. So in a way you have less freedom but that’s also good. It forces you to get more creative with your limitations, and you learn a lot from that.